I love this spread of the album! Weddings are as much about the details as they are the BIG moments. 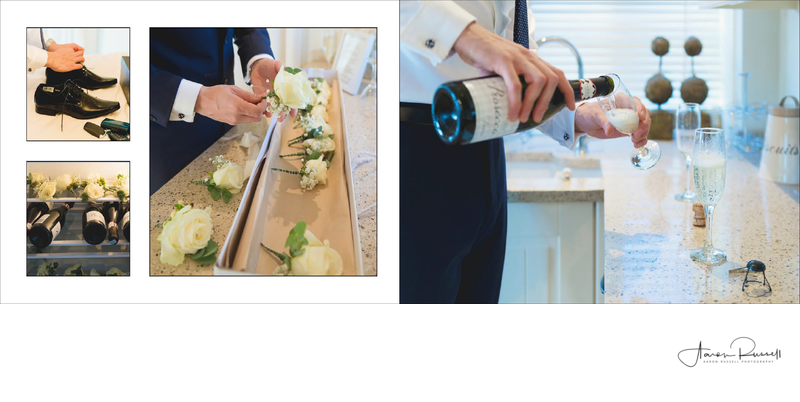 Here the groom is preparing his shoes, buttonholes and of course the Prosecco. Ben was getting ready close to Le-Anne at another Barn Conversion that had been turned into a beautiful guest house. I love these types of preparation areas. They are full of character with lots of little nooks and crannies that can be explored and let my creative juices start to flow to capture wonderful wedding photographs that are as individual as you are.